The popular novelist and military historian Winston Groom has lately taken to writing informative and relatively concise joint biographies of World War II military and political leaders for National Geographic. This is a most worthy effort. In 2013, he wrote The Aviators, which traced the lives and careers of Eddie Rickenbacker, James Doolittle, and Charles Lindbergh. Two years later, he wrote The Generals, which explored the lives and wartime accomplishments of U.S. Generals Douglas MacArthur, George Patton, and George Marshall. Now, Groom has written The Allies, a joint biography of Winston Churchill, Franklin Roosevelt, and Joseph Stalin who together led their nations in resisting and ultimately defeating Germany, Italy, and Japan in World War II. The great difficulty in writing a joint biography of Churchill, Roosevelt, and Stalin is deciding what to include and what to leave out. Historians have written multi-volume biographies of each of Groom’s subjects. Martin Gilbert’s authorized biography of Churchill, for example, extends to eight lengthy volumes. Groom’s approach is to highlight the experiences and events in his subjects’ lives that shaped their characters and influenced their decision-making in the most destructive war in human history. Churchill and Roosevelt were sons of privilege; reared as elites in Western democracies. Stalin grew up in Gori, Georgia, the son of a violent alcoholic shoe cobbler in the autocratic Russian Empire. Churchill attended Harrow and Sandhurst with the expectation that he would have a career in the military. Roosevelt attended Groton and Harvard in anticipation of a legal career. Politics attracted both men. Churchill’s father was a rising Member of the House of Commons. Roosevelt’s cousin was New York Governor and later President Theodore Roosevelt. Stalin’s mother enrolled him in a theological seminary “with the goal of turning him into a priest.” It was while he was at the seminary that Stalin became a Marxist and a revolutionary. Soon, he was a member of Lenin’s Bolsheviks, participating in armed robberies and extortion to raise money for the Party. Prior to entering Parliament, Churchill, doubling as a combatant and newspaper correspondent, saw combat in Cuba, India, the Sudan, and southern Africa. War excited him and he wrote about it with verve and an attractive style. World War I also shaped the character and careers of the three men. Churchill headed the Admiralty, was forced to resign over the Dardanelles fiasco, fought on the Western front, and rejoined the cabinet toward the end of the war. Throughout that conflict and later struggles, his lodestar was the defense of the British Empire. Roosevelt rose to become Assistant Secretary of the Navy in the Wilson administration. He shared Wilson’s beliefs in using the state to uplift the poor, ending empires to bring about the self-determination of peoples, and the efficacy of a League of Nations to ensure world peace. These would be Roosevelt’s lodestars. Groom notes that during this time Stalin underlined the following passage in his copy of one of Marx’s books: “There is only one way to shorten and ease the convulsions of the old society and the bloody birth pangs of the new: revolutionary terror.” This would be Stalin’s lodestar. All three future war leaders overcame obstacles on their journeys to power. Churchill spent a decade in the political wilderness, viewed as unreliable and irresponsible by the British establishment. Roosevelt contracted polio and lost the use of his legs, and had to respond to the Great Depression. Stalin fell out of favor with Lenin, but ruthlessly clawed his way to power over the bodies of his rivals. In the run-up to the Second World War, Churchill played the role of prophet, Roosevelt lacked the political courage to directly confront Hitler and Japan, and Stalin was Hitler’s accomplice in mass murder and European aggression. It is often forgotten that the Nazi-Soviet Pact was a totalitarian conspiracy to dismember Poland and Eastern Europe. Stalin only became the ally of the democracies because Hitler violated the Pact. Churchill and Roosevelt were natural allies in the Second World War. Both led countries that were sea powers whose security was threatened by a power or alliance of powers that dominated Eurasia. Britain and America shared a common language and culture, and had fought as allies in the First World War. Even before the U.S. became a belligerent in World War II, Roosevelt did what he could to aid Britain’s war effort without endangering his political position at home. War and the survival of the state, however, sometimes force political leaders to base policy on necessity. To defeat Hitler, Churchill and Roosevelt joined hands with one of history’s greatest mass murderers. They were right to do so. When Germany invaded the Soviet Union on June 22, 1941, Churchill rallied Britain to the aid of Communist Russia despite having urged the destruction of Bolshevism after Lenin seized power in 1917. Churchill made it clear, however, that he still believed communism was evil. Churchill’s approach was: The enemy of my enemy is my friend. Roosevelt’s approach was different. As Groom notes, he and his administration portrayed Stalin as benevolent “Uncle Joe,” the heroic ally in the struggle against Hitler. Worse, when it became clear the Allies would win the war, Roosevelt attempted what Robert Nisbet called “the failed courtship” of Stalin in the vain hope that the Soviet Union would be a force for good in the postwar world. That said, Groom rightly judges Churchill and Roosevelt to be great war leaders. They led their countries to victory and liberated millions of people from Nazi and Imperial Japanese rule. They also both recognized that victory was impossible without Stalin’s Russia, and they acted accordingly. Churchill more so than Roosevelt understood, however, that the alliance with Stalin meant that triumph would be followed by the tragedy of the Cold War. Knowledge of the Second World War and an understanding of the role played by the dominant personalities who shaped the war are fading from memory. For some, the war and its leaders are ancient history. 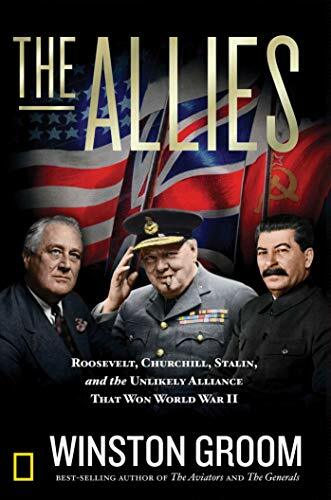 Winston Groom’s The Allies: Roosevelt, Churchill, Stalin, and the Unlikely Alliance That Won World War II will hopefully help a new generation learn about the heroics, the horrors, and the tragedies of World War II.